Atim operates a tractor at Amatheon farms to premises. Irene Abalo. NWOYA. Sixty-three kilometres north of Nwoya District sits Amuru District wherein is Apaa Parish. Nwoya is bustling with commercial land activity that has all tribes of people coming together to talk with their efforts and dreams while earning a living. Amuru is riddled with arrowheads and tainted with blood, a result of another bitter struggle over land in Apaa parish. No doubt a stark contrast between the two places so close apart. But if the clashing Acholi and Madi in Apaa had the bird’s eye to see 63 kilometres away in Nwoya, they would be in envy at the power of land to embrace a diverse tribe of people. But Apaa issue aside, the case for Nwoya commercial farms is to agriculture, a sector that has for several years formed the backbone of Uganda’s economy, employing up to 70% of the population and contributing approximately 37% of the GDP. In northern Uganda, the over two decades of the LRA war that displaced people and left millions confined in Internally Displaced Persons camps meant much of the fertile land remained idle as the war hampered farming activities. But with the war in the past, people have taken to expanding beyond the kitchen gardening that LRA war had restricted them to. Commercial farming has taken shape and, with it, a thriving populace of diverse origin. Carved out of Amuru in 2006, Nwoya is said to have one of the most fertile soils. This has attracted more than 26 commercial farmers, growing mainly cereals and grains sold on the world market and to the World Food Programme. Most of the farms are heavily mechanised with requirements for skills at the farm. Rigli Agro Tech Limited, an Indian farm managed by Sharma Kulwinder, is one of the commercial farms dealing in mainly cotton, green grams and soya beans. Their skilled labor are a mixture of Ugandan nationals. “This gentleman is from Hoima, some from Pakwach, Arua, like our cooking staff all is from Arua. Then other people they are technical, there are drivers from Kenya… Then other people are from Gulu, Nebbi, and Kampala. On this farm, we accommodate all tribes of people,” Kulwinder says. Rigil Agro Tech employs over 168 staff depending on one’s choice of whether to be on contract or ‘per-day’ payment. Emily Susan Atim is one of the labourers on the farm. She is employed by one of the largest farms in Northern Uganda. Amatheon Agri, a multi-billion German commercial farm set up on over 3,000 hectares of land in Lungulu, Purongo and Got Apwoyo Subcounties in Nwoya . Amatheon Agri Uganda Limited grows mainly rice and maize for the world market, sorghum for breweries and green grams and other crops on a pilot study. The company employs more than 200 casual labourers during peak seasons, especially for weeding and harvesting. About 100 are permanent staff. Atim is a 19-year-old orphan living with her mother. Her father fell on the frontline in Somalia while serving under Amisom peacekeeping mission. Despite losing her father and seeing her widowed mother struggle to raise five siblings, her hope is restored in a job with Amatheon Agri where she is a full-time worker with medical and NSSF benefits. At her age, Atim says her priority is to help her family live a better life with her earning from the farm. “I don’t need much from my salary because they provide almost everything at the farm, from accommodation to feeding, and medical care. The technology is superb. I can access internet and many other amenities so the money I make is mostly for my family support,” she says. Atim was in Senior Three at Gulu College School in 2016 when she dropped out to acquire vocational skills that hoping it would provide her with more opportunities. It did. “It pained me to see my mother struggling with school fees and feeding us. So when she gave me the idea of training as a tractor driver because there were opportunities at the various big farms in Nwoya, I didn’t hesitate,” she says. 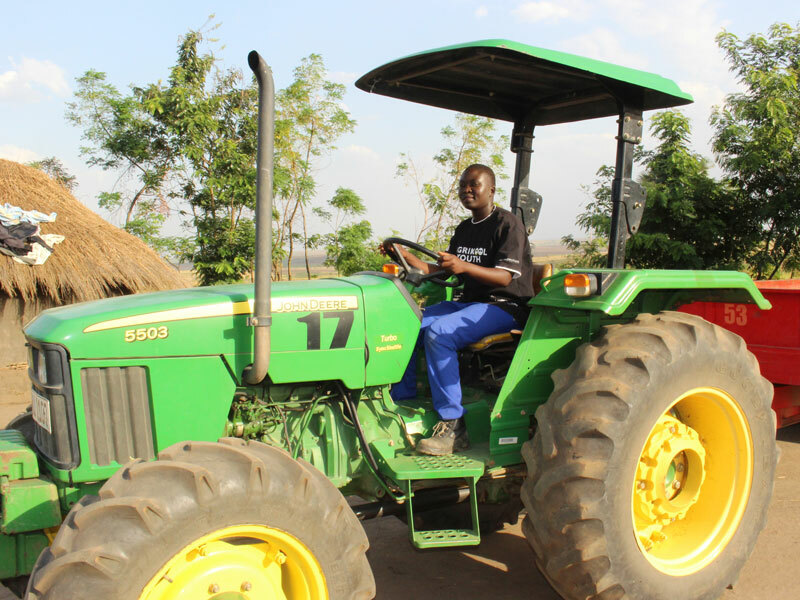 It took Atim two months to commit her heart to learning tractor driving from Youth Empowerment Centre, a charity organisation in Nwoya District that trains young women vocational skills in mechanics. Her skills and enthusiasm to learn attracted the attention of her tutors, who helped her with a placement to a company they believed could offer her a job as a tractor operator. “We were about 15 girls trained in that lot. We started work at different farms but some dropped out of the training because they were discouraged by their friends that tractor driving is a job for men and no man would want to marry such a woman. Others were told that if you drive as a woman, your back aches and you will not be able to give birth normally. I ignored all such ‘nonsense’ because if men were driving and they had no health problems, why would I? I only made sure I consulted with my seniors in the field to be on the safer side,” Atim says. She has now worked for almost a year and is the most cherished tractor operator at Amatheon Farm in Lungulu Subcounty because of her commitment to work, temerity and knack for picking on new skills. She dreams of becoming a professional tractor driver after more training. “Being a tractor driver has really changed my life because there were many things that I was doing before. I was very stubborn at school. But now I feel like a responsible adult,” she says. Atim earnes Shs350,000 per month and says this money helps pay fees for her two siblings in primary school. In Alingiri Village, Nyamukino Parish, Stephen Ephraim, 28, employee of Amatheon Agri. He is a university graduate and works at the farm as an agronomist. Ephraim says he has been able to buy land back home in Mukono and is about to finish constructing a three-bedroom house. “I joined Amatheon in 2014. Previously, I was in outreach, training farmers in farming skills but here, you get to learn farm management. You have to follow the daily operations of the farm, from planning to execution. So I have gotten that experience,” says Ephraim. Nancy Akumu, the sustainable development manager at Amatheon Agri, says the future is promising considering the fertile soils and vast land for cultivation. The area under cultivation now as I speak is 3,000 hectares. The commercial farmers in Nowya are impacting on the agriculture sector by offering not only employment to interested locals but also training them with skills that they can later apply in their own gardens with the hope of becoming commercial farmers and having more out growers in future. So why is there no conflict in Nwoya over land matters being cultivated on by foreign entities yet Amuru nearby is smouldering from clashes and have for years fought off Madhvani Group from acquiring land in the area to grow sugarcane? 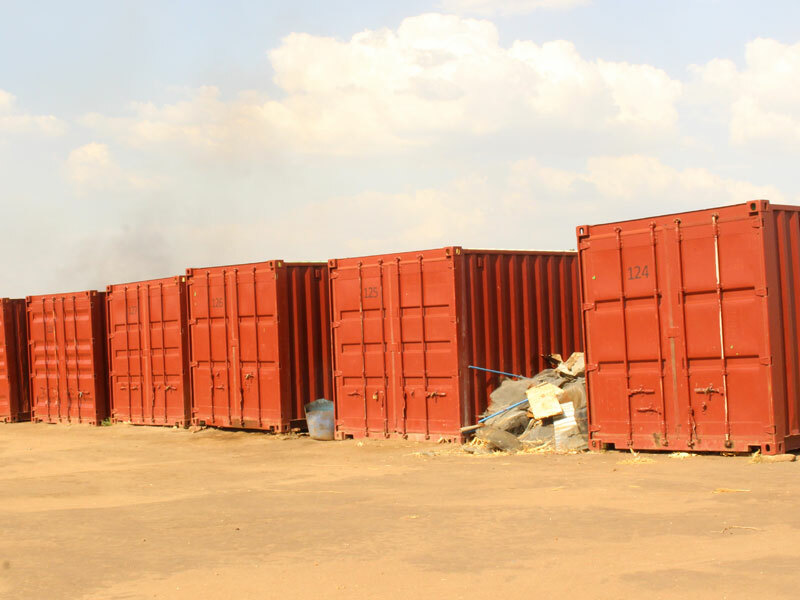 Patrick Okello Oryema, the LCV chairman of Nwoya, told PML Daily that the district prefers to use the bottom-up approach for land acquisition after identifying conflict free land for the investors. “We identify land owners with conflict-free land and give space for direct negotiation with the investors for lease, not selling their land. The essence is they rent the land out for a specific period of time and the land reverts back to the owner,” Oryma said. The land owners are advised to give lease for at least 49 years. He said the district encourages the commercial farmers to employ more of the local people though there is a challenge of lack of the culture of hard work and the required skills that come with such big enterprises. The commercial farms in Nwoya employ people from diverse backgrounds, some hailing from as far as South Sudan, others from Busoga, depending on their expertise. “We still need to teach our people to embrace the kind of work done in these commercial farms. Most of our youth are lazy and when they get work on the commercial farms, they are challenged by the demand for hard work and skills application,” Oryema said. On getting revenue from the commercial farms, Oryema said the district was still in the process of having an inventory to assess output of the commercial farmers. “We have not done that inventory because we have just recruited a commercial officer who we hope will do that work for us. But what you should also know that agriculture is almost tax free under the law. For now we are not yet gaining apart from the corporate social responsibility they offer to our community like constructing boreholes and a facility that allows cost sharing at their clinic and some have delivered desks to schools within the district,” he said. The investors are still stabilising their business since 2010 when the first farm, Delight Uganda Limited, started operations in the district to grow citrus and mangoes for juice production. The district plans to organise an investors’ forum in the near future to bring them together and regulate their activities.